Now, the problem is that the PATH variable is treated such that the value you enter for the user PATH will be automatically appended to the system PATH and that will be the effective PATH variable. However, I would rather like that for a very specific OS user account the PATH environment variable should have the bar\bindirectory at the beginning of the PATH instead of at the end. 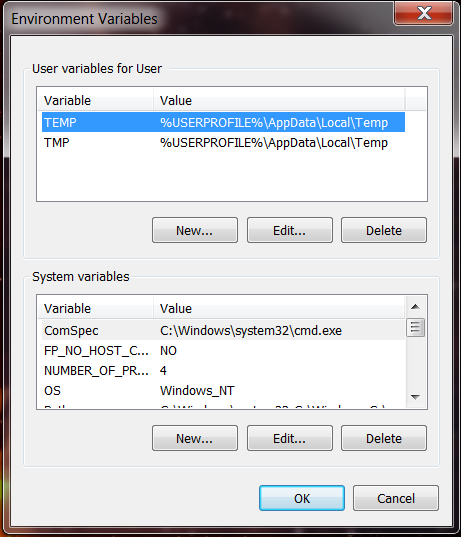 Is there a proper way to tell windows to completely override the PATH variable of a user with the value for that user instead of appending it to the system PATHvariable? Note: Obviously, from a batch file, all this doesn't matter as you can set and tweak the env.vars as you like. But then you have to parse this and use the relevant part. I read the solution here here and tested on my machine. I don't know how to ignore system variable, but I know that if you use session variables (via SET command), they take precedence over other variables. So you can use SET PATH=C:\Program Files\Bar\bin instruction and your desired path will be the first part of the variable. If variables with the same name are stored as both User and Machine Environment variables, the user variable will take precedence. If a Session variable is created that will take precedence over any User and/or Machine Environment variable with the same name. Not the answer you're looking for? Browse other questions tagged windows-7 windows path environment-variables or ask your own question.